*Either 1 can of pitted ripe ones and 1 jar of stuffed ones or get a variety from the deli section of the grocery store. My favorite combination is to get a combination of black olives, green olives stuffed with blue cheese, and green olives stuffed with jalapenos. Olives stuffed with garlic are good too, but since there is already garlic in this recipe, I usually go with something else. You will need 11 oz of olives total. Drain and chop the olives. 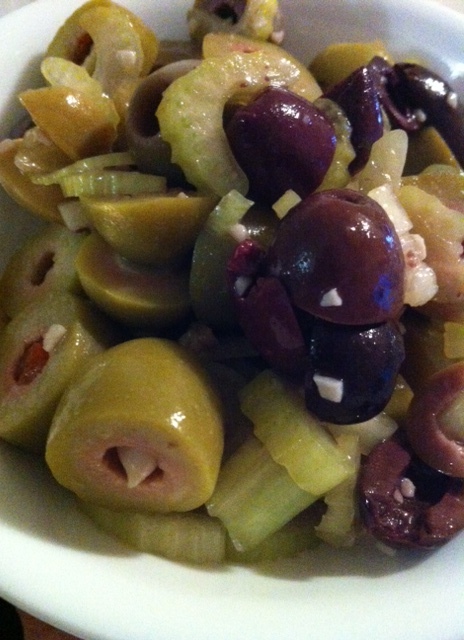 Combine olives, celery, and garlic in a bowl. Drizzle with 2 Tbsp of olive oil. Toss to coat. Cover and refrigerate for at least 4 hours. Combine 1 1/2 Tbsp pf minced garlic, 1/2 tsp of salt, 1/2 tsp of pepper, and 1/2 tsp of dried rubbed sage in a small bowl. Remove and discard giblets and neck from chicken. Starting at neck cavity, loosen skin from breast and drumsticks by inserting fingers, gently pushing between skin and meat. Lift wing tips up and over back; tuck under chicken. Rub garlic mixture under loosened skin. Place chicken, breast side up, on rack of a broiler pan coated with cooking spray. Place rack in broiler pan. Cut 12 oz of red potatoes into wedges. Cube and peel 8 oz of butternut squash – should end up with 1 1/2 cups. Combine potatoes, squash, butter, 1 1/2 teaspoons garlic, 1/2 teaspoon salt, and 1/4 teaspoon pepper. Arrange vegetable mixture around chicken. Bake at 400° for 1 hour or until a thermometer inserted into meaty part of thigh registers 165°. Let stand 10 minutes. Discard skin. Spread 1 Tbsp of spicy brown mustard on an English muffin. Add 1/4 cup of cottage cheese on one half. Sprinkle with 1 Tbsp of chopped chives and garlic powder to taste. On the other half, add 2 slices of tomatoes, 1/4 of a sliced avocado, and a leaf of butter lettuce. Cook 1 lb of ground beef in a skillet over medium heat. Drain. Add a can of sloppy joe sauce and a can of cream of potato soup. Place a package of frozen cubed hashbrown potatoes in a greased baking dish. Top with beef mixture. Cover and bake for 20 minutes. Uncover. Bake 10 minutes longer. Sprinkle with cheese. Preheat oven to 375 degrees. Cook enough long grain rice to equal 1 cup. Combine a can of refried beans, 1 cup of salsa, rice, and 1 cup of shredded cheddar cheese in a bowl. Spoon about 1/3 cup off-center of each of the 12 flour tortillas. Fold the sides and ends over filling and roll up. Arrange burritos in a greased baking dish. Sprinkle with 1 cup of shredded cheddar cheese. Cover and bake for 20-25 minutes. Peel and roughly chop peaches directly into baking dish. You can use a vegetable peeler and a paring knife, but you can also blanch stone fruits to get the skin off. In a food processor, blend 1/2 cup of flour, 3/4 cup of brown sugar, a pinch of salt, and 6 Tbsp of chilled cubed butter or Earth Balance with several on-off pulses or only until the mixture looks like a coarse meal. Add 1 cup of quick or rolled oats and pulse a few more times to break them up. Spread topping over fruit. Bake for 45-55 minutes. Depending on the juiciness of the fruit and how full you filled your dish, you may want to put some foil below the pan in the oven to catch any overflow. In a bowl mix 1 cup of rolled oats, 1/4 cup of almond meal, 2 Tbsp of chia seeds, 1 cup of coconut flakes, 1/2 cup of chopped mixed nuts, 1 cup of mixed dried fruit, 1/2 tsp of salt, 1 1/2 tsp of cinnamon, and 1/2 tsp of allspice. In a separate bowl, mash 3 bananas with a fork until it’s all gooey. Add 1/2 cup of applesauce and 1 tsp of vanilla. Add the wet ingredients to the dry ones, and mix until is well incorporated. If the mixture seems too dry, just add more applesauce. Place heaping tablespoon-fulls onto a cookie sheet, mold into rounds, and press down slightly. Bake for 20 minutes.